A perfect fit for all types of beds, even adjustable beds, hide-a-beds, RVs, etc. Adjustable length to work for all sheets,i.e. flat or fitted sheets. 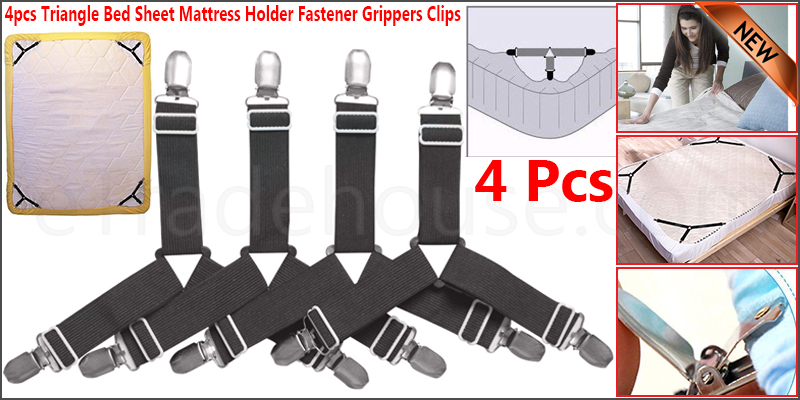 Adjustable heavy duty elastic straps with sturdy metal clips, fit for 2 bed sheets sides, one used diagonally for each corner of the bed. 2 pull side clips for each corner to hold the sheets firmly in place. High-quality elastic bands provide strong and long-lasting grip. Well-made chrome clips are sustainable and will not break easily. Built-in plastic teeth will hold the mattress sheet tight while not harming the fabric. 1. Easy application Simply clip both ends of one band onto the edges of the sheet on the underside corners/middle of the mattress. 2. Then repeat for the other band. 3. The sheet fasteners will hold the bed sheet firmly in position and prevent it from slipping off the mattress.